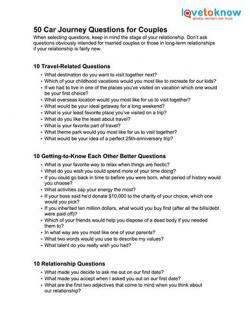 If you're hitting the road with your honey, prepare for lulls in the conversation with a stockpile of questions on a variety of topics. 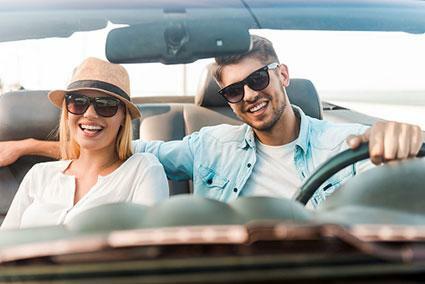 While you don't have to fill every minute you're in the car with chatter, the miles will pass more quickly if you have plenty of pleasant conversation topics to talk about. Plus, you just might make some memories with that special someone by sharing a few laughs or gaining new insights, depending on what direction your conversation takes! When selecting questions, keep in mind the stage of your relationship. Don't ask questions obviously intended for married couples or those in long-term relationships if your relationship is fairly new. What destination do you want to visit together next? Which of your childhood vacations would you most like to recreate for our kids? If we had to live in one of the places you've visited on vacation which one would be your first choice? What overseas location would you most like for us to visit together? What would be your ideal getaway for a long weekend? What is your least favorite place you've visited on a trip? What is your favorite part of travel? What theme park would you most like for us to visit together? What would be your idea of a perfect 25th-anniversary trip? What is your favorite way to relax when things are hectic? What do you wish you could spend more of your time doing? If you could go back in time to before you were born, what period of history would you choose? What activities zap your energy the most? If your boss said he'd donate $10,000 to the charity of your choice, which one would you pick? If you inherited ten million dollars, what would you buy first (after all the bills/debt were paid off)? Which of your friends would help you dispose of a dead body if you needed them to? What two words would you use to describe my values? What talent do you really wish you had? What made you decide to ask me out on our first date? What made you accept when I asked you out on our first date? What are the first two adjectives that come to mind when you think about our relationship? What TV show comedy best portrays our lives? If a movie was being made about us, who would play you and me? What is your all-time favorite memory about our time together? What is something you wish you could change about the early days of our relationship? What ideas do you have about how we could improve the 'couple time' we spend together? What compliment would you really like to hear from me? Who is the most famous individual you have met in person? What have you never done before, that you would most like for us to try together, if money and time were no object? What is the most courageous thing you have done so far? What would you say is the biggest adventure we have had together so far? What is the first thing you purchased using money you earned? What negative thing has happened to you that actually turned out to be for the best? What is something you did not want to do at all that turned out to be a terrific experience? What's an event or activity you have attended with me that you would have preferred not to participate in? What food would you never eat, under any circumstances. What would we do on your ideal date night? What's your favorite thing for us to do together on weekends when the weather is too bad to go out? What irritates you the most in restaurants? What song do you really love to listen to when you are driving for a long time? What is the first thing you notice when you look at a man? Ditto for a woman? What qualities or characteristics in a person would cause you to want to have nothing to do with him or her? Other than a dog or cat, what kind of pet would you most like for us to have? Of course, the point of these questions is to start a conversation and help keep it going. Don't run down the list of questions like you're checking things off as fast as possible. This isn't an interrogation or a job interview, but an interaction between two people who care about each other. Pick one (or a few) to discuss and explore the response. Follow up by asking 'why' or encouraging your partner to tell you more, then see where the conversation leads the two of you. Your time on the road will pass quickly and you'll know a bit more about each other by the time you arrive at your destination!